When GWC Warranty moved into a new office last year, we had a contest to name the 4 common rooms. After fielding a lot of ideas that were clever but didn't quite capture the spirit we were aiming for, Joe Brennan, our VP of Operations, had a "lightbulb" moment: He suggested we name the rooms after business thinkers that had been transformational to us as we charted a new course for GWC. We had photos of each of the business thinkers printed and mounted on the doors to memorialize them and inspire us. There was one obvious candidate for our Board Room: Jim Collins, author of "Good to Great" and other insightful books and articles that lay out a manifest for companies that strive to be great. So, it was obviously a thrill for Jeanette Bogdon, our VP of Human Resources, to learn that Jim would be a featured speaker at the national Society for Human Resource Management annual conference in Atlanta last month. She dutifully peeled down the photo off the Board Room door and proudly presented it to Jim for his signature. Based on Jim's reaction to Jeanette's telling him that he'd beaten out other business luminaries to end up on the door to our Board Room ("I love that! "), I think Jim may have been even more thrilled than Jeanette! But we're honored to have his signature up in our office and proud to be a company trying every day to be great. It's beach reading season so I picked up a book that's been on my "to read" list for about two years, Stephen King's "Full Dark, No Stars." Unfortunately, I made the mistake of peeking into it one night at home and ended up zipping through all four novellas in just a few days! 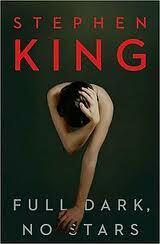 I'm not a regular Stephen King reader, but he is a fascinating storyteller. The tales in "Full Dark" all feature people in varying states of distress, forced to make the most with impossible situations (sometimes of their own doing). It's a compelling read, perfect for the beach (or the couch, in my case), preferably in the light of day.